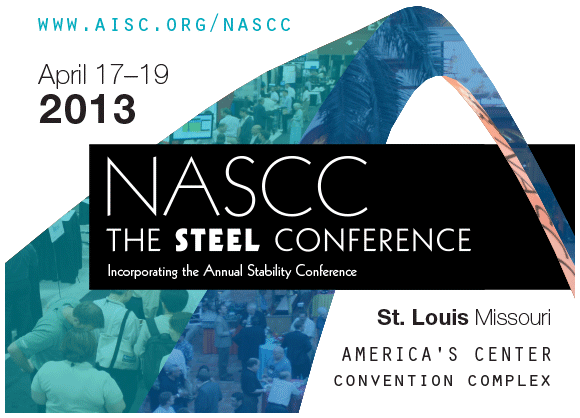 This year’s NASCC: The Steel Conference is to be held in St. Louis, Missouri, on April 17 through 19. The conference offers more than 100 technical sessions, plus a tradeshow featuring the most innovative products in steel. More than 3,500 attendees are expected this year. Of the more than 200 exhibitors, many are Design Data partners and customers! We’re always happy to see so many familiar faces at the conference, and we look forward to seeing everyone there each year. Below, you’ll find a list of all partners and customers currently scheduled to exhibit. For more information about 2013 NASCC, view the advance program.